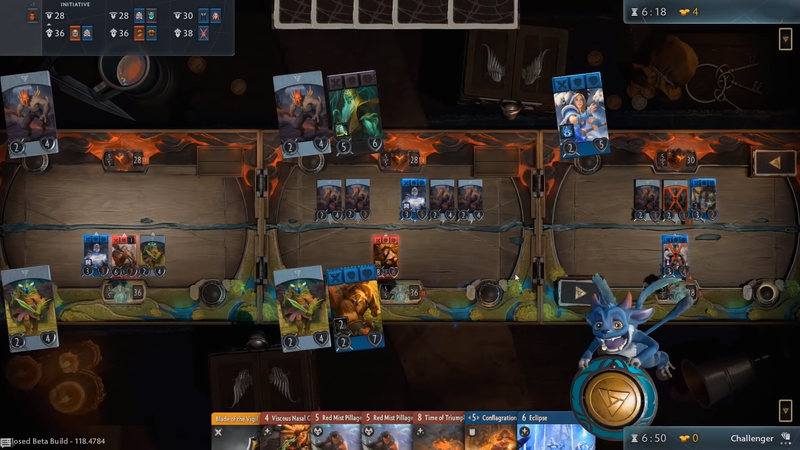 Artifact is a digital collectible card game published by Valve Corporation, developed in collaboration with Richard Garfield, creator of Magic: The Gathering. Artifact is built within the DotA universe, borrowing creatures, magical items, and characters from the franchise’s extensive lore. This is the board that Artifact is played on. The first thing you might notice is that the game is played across three separate game boards, referred to as Lanes. 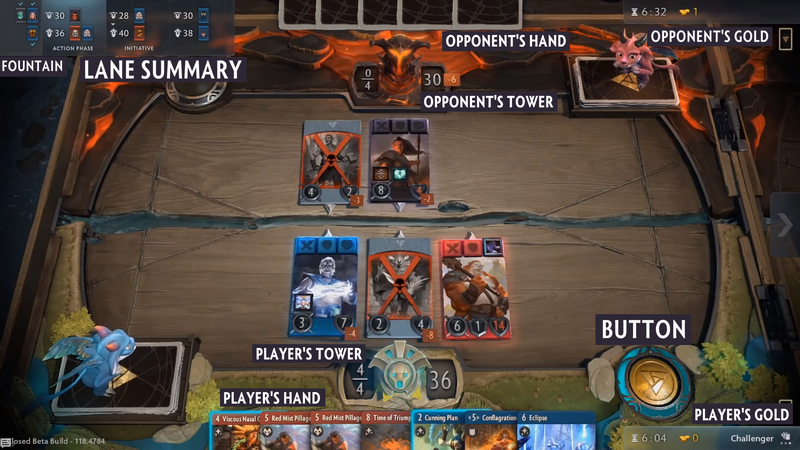 This is one of the biggest elements of Artifact that makes it unique, in comparison to other card games. On the player’s side, as well as the opponent’s, each lane has a Tower. Towers start with 40 Health and 3 Mana. 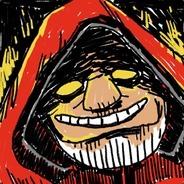 In the DotA universe, two ancient powers are at war, The Radiant and The Dire, these powers have influence of the Artifact world as well, creating Towers to represent themselves. Whenever a Tower is destroyed, the very essence of the Ancient bursts from the ground, creating a new target for the opponent. Ancients have 80 Health. The game is won by destroying either two Towers, or destroying an Ancient. This is Lane One, you can see the tower’s Mana and Health pool much clearer here. The red indicators on the bottom right of cards and towers will notify you of incoming damage, before the Combat Phase. In the top left of the screen, you can see the Lane Summary window. The Lane Summary offers a ton of valuable information, allowing you to see every lane’s Heroes, at a glance. As well as what Phase the game is currently in, who has Initiative, as well as what Heroes are in The Fountain. The Fountain is where a Hero goes when they die on the battlefield. Whenever a Hero dies, it must sit out for an entire round of battle before it can be re-deployed into combat. One Hero, has an ability which gives him Rapid Deployment, allowing Rix to automatically go back into battle after dying. There is also an item card, , which gives this effect as well. The Button is a golden coin in the bottom right of the screen. In Poker, the Dealer’s Button is what is used to show which player has the advantage when a hand is dealt. When the Button is available, you have the ability to play a card. Whenever a card is played, Initiative is passed to the opponent (Initiative will be covered in greater detail, later in this article). Players also have the option to Pass when they have The Button. Passing will not transfer initiative. A Lane will enter the Battle Phase whenever both players have Passed in a lane (This will also be covered later in this article). Gold is acquired by killing enemy Heroes or enemy Creep units. Whenever you kill a Hero, you gain 5 Gold. are worth 1 Gold. One Hero, comes with a Signature card, , which increases a Hero's Bounty by +10 Gold, which means you can earn 15 Gold by killing a Hero that's been Tracked! There are five types of cards. Creep cards, Spell cards, Improvement cards, Item cards, and Hero cards. Each of these are played differently and interact with the game state in their own ways. The Mana Cost of all cards can be located in the top left of the frame, followed by the card’s Name. Underneath the Mana Cost and name, you will see an icon indicating what type of card the card is. Creep cards, such as , will have their own Attack and Health values, and occasionally come with Armor. A creep card is played into a lane as a physical unit, which can do battle with the opponent, damage their tower, or kill their Heroes. Some Heroes have effects or Activated Abilities, be sure to read them very carefully! Spell cards, such as , are cards that have an immediate effect on the board, sometimes dealing damage to units, sometimes healing a unit, or something else entirely, each spell is unique! Some of the most powerful cards in Artifact are Spells, one example is a card that costs 10 Mana to cast, making it the highest Mana cost card in the game! ! Improvement cards, such as , are cards that “Upgrade” a Lane’s strength, permanently. Some Improvements will give your tower more Mana, increase the attack of your units, or even deal damage to enemy units every turn! There are also some Improvement cards that will effect both the player's side and the opponent's side of the Lane, . If you notice in the top left, around the Mana cost of the card, you see a left and right arrow. This means that the card can be played in one lane, but sent to another lane. For instance, if I have a Green Hero in Lane one, I can activate , but send it to Lane Three! Item cards, such as , are bought with gold, which you earn from killing enemy units. With Item cards, you equip them to your Heroes to upgrade their stats and sometimes give them interesting bonus effects. Some item cards are Consumables, granting one of your Heroes a one-time use effect. . 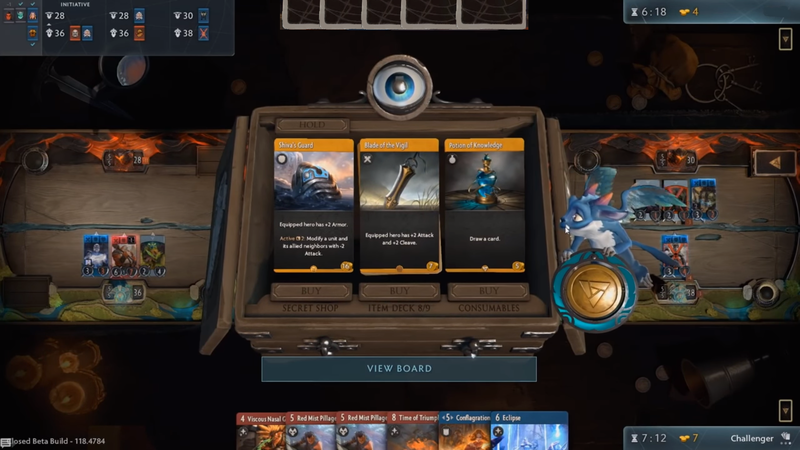 Hero cards, such as , are the most important part of playing Artifact! Whenever a Hero is in your deck, you are automatically forced to play 3 copies of that Hero’s Signature card. Axe's signature card is , a Spell card. Signature cards can be Creeps, Spells, or Improvements. Wouldn’t it be interesting if a Hero had 3 Items as their Signature card? All cards, other than Items, are assigned to a Color. When you want to play a card in a lane, a Hero of the same color must be present. For example, if you have a in your hand when you are on Lane One, you can only play that card if a Green Hero is in Lane One. This is just another example of why Heroes are so important! Red Cards are designed around buffing Hero cards to be stronger. Adding Armor, adding effects like Cleave, Retaliate, or even just increasing the total Attack value. Red cards typically want to force combat, making your opponent attack into your beefy units. Red Heroes typically have the highest total stat values. Green Cards are designed around buffing Creep units. Giving Creeps extra Health, Armor, as well as Regeneration. Many Green Heroes are designed to buff the ally units to their left and right. Some Green spells are designed to increase a Tower's Mana Total, ramping up to summon giant Creeps! Blue Cards are designed around controlling the board. Damage spells, board clears, and tower damage spells, are just some examples. Blue Heroes are the weakest in terms of Attack and Health. Blue would prefer to avoid combat all together, winning during the Action Phase with powerful Spell cards. Black Cards are designed around direct tower damage and killing heroes. Increasing Hero and Creep tower damage with added Siege, direct removal spells, and targeted creep damage. Black Heroes have low Health but very high Attack, as well as many Hero abilities that increase damage dealt to enemy Hero units! This is the very first splash screen when a game begins. The Player’s Heroes are located on the bottom, and the opponent’s are on top. 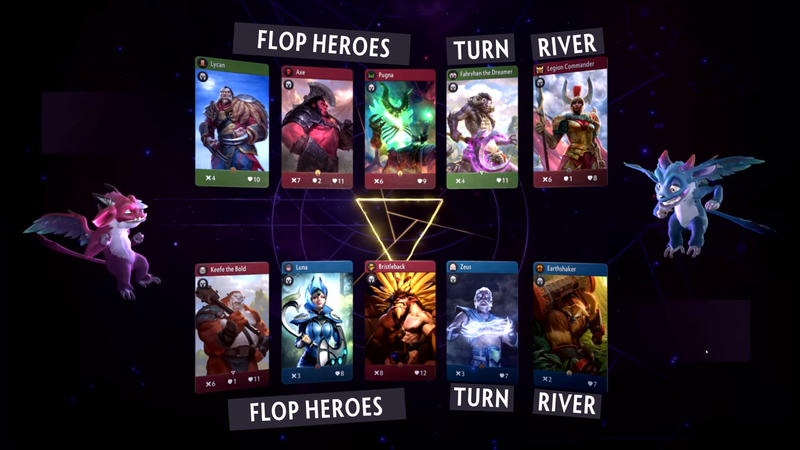 The first three Heroes of each player’s team are referred to as “Flop Heroes” because they spawn at the beginning of the game, randomly. Next is “The Turn”, and the last Hero to be deployed is “The River”. When building your deck, you are able to choose what Heroes go into the Flop, the Turn, or the River. Be mindful of how much Health your Heroes have, because if you put a low Health unit in the Flop, it's possible the enemy Flop Heroes might be able to kill it too easily, on the very first Round! The Flop and Combat are Phases where neither Player can play any cards or interact with the board in any way. This is why these Phases are highlighted in Red. “The Flop” is the very beginning of the game. Here, the first Three Heroes of each team will spawn randomly in one of the Three Lanes, one Hero per lane. Then, a total of three Melee Creeps will spawn in random lanes, as well, with a maximum of two Creeps in one lane. Many people think this is a perfect example of “Bad RNG”. Personally, I find this design choice to be one of the best things about Artifact, because it makes every game start differently! 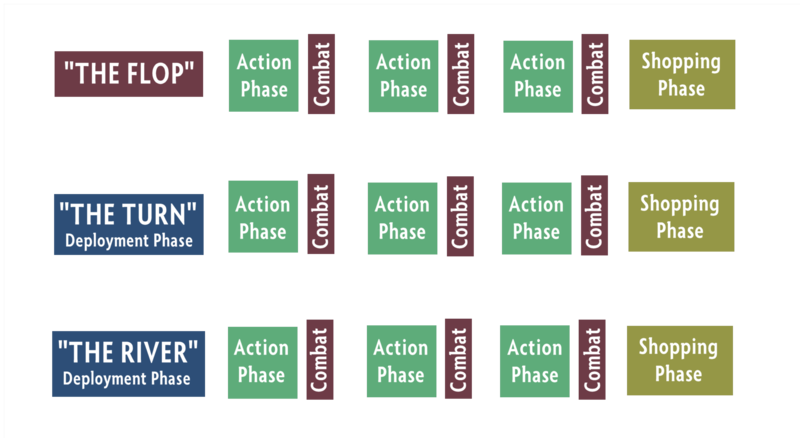 Blue Phases, such as “The Turn”, “The River” and any Deployment Phase thereafter, are Phases where each player spawns 2 Melee Creeps, and if a Hero is ready for deployment, they choose which Lane the Hero is sent to. Here, it looks like the Player decided to put Earthshaker in the middle lane! These Pathing cards are what dictates where a unit will attack. Sometimes, multiple Units might all target the same enemy, allowing them to all Gang up on one unit! This can be both bad or good, depending on the situation. 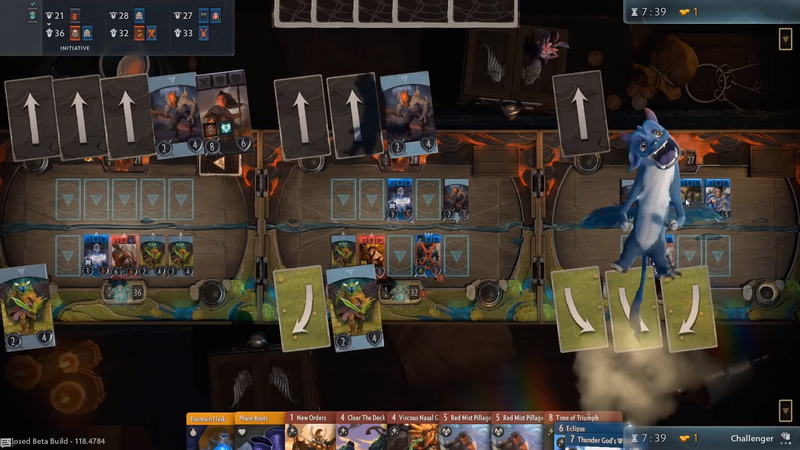 In Artifact, there are many cards that allow players to alter the Pathing of their units. Keep an eye out for these cards, they can be very powerful if used correctly! Action Phases are where the majority of Artifact’s action takes place, hence the name! Here, Players take turns passing Initiative and playing cards of various types, attempting to alter the board to better enhance their Combat Phase! The only way a Lane will proceed from the Action Phase into the Combat Phase, is if both players “Pass” When they have the Button. Passing does not lose you Initiative, if you have it. During the Combat Phase, both player’s boards will attack one another simultaneously, either hitting each other and killing units, or attacking directly into Towers, lowering its total health. If you kill an enemy Hero, you are awarded 5 gold. Enemy Creeps are worth 1. The last phase of every round is the Shopping Phase. Here, players spend any Gold they earned to buy Item cards for their Heroes. The Player has enough gold to buy either Blade of the Vigil or Potion of Knowledge! Which would you pick? After the Shopping Phase ends, all effects that persist until the end of the Round are negated, all Heroes in the Fountain have their wait time reduced by one, and then you will begin the next round. When a round begins, every Tower in the game will have its Mana refilled, and its total Mana will increase by 1. Damage on units will of course persist through rounds, until the unit is killed or healed fully. Why is Initiative so important? Initiative is basically the ability to play a card first in a Lane. As I’ve explained earlier in this article, a Player can not play a card unless a Hero of the same color is in the lane. Take a look at a card like . Gust silence all enemy Heroes in a lane, for an entire round. When Silenced, a Hero can not fulfill any card’s color requirement, in the hand. If I’m going into Lane One, with Initiative, and I am able to cast Gust right away, that means all of my opponent’s Heroes are silenced. That means my opponent can’t play any cards from his hand at all. That’s why Initiative is so important. If I didn’t have initiative, my opponent could have spent all of their tower’s Mana and played some big Creep that I wouldn’t be able to deal with, and Gust’s effect wouldn’t have been useful at all, because all their Mana would have been spent anyway. Another example of a card similar to Gust is the Red Card, Enough Magic! forces a lane to proceed to the Combat Phase, immediately. If I have Initiative in a lane, that means my opponent won’t get to play a single spell at all. Other ways to block your opponent in a lane, when you have Initiative is the Blue Spell, . This spell immediately deals 4 Piercing Damage to all enemy Heroes, across all lanes. Piercing Damage means it goes through Armor. If I play this card on Initiative, if my opponent’s Heroes in lane are less than 4 total Health, I’m able to kill those Heroes, before my opponent can even play a card! Within Artifact, there are cards like , which allow you to gain back initiative. Let’s say I didn’t have Initiative in a Lane and my opponent did. They could pass each time they have the Button, hoping to have Initiative when the next lane starts. If I were to use Hip Fire, I could potentially kill a Melee creep, and take back Initiative before going into the next lane, interrupting my opponent’s plans! There are many ways Initiative can be manipulated during the course of a match. This is one of the most complex parts of Artifact and will be the decider of many matches. Thanks for reading! You can follow Artibuff on twitter @Artibuff and you can follow me @rokmanfilms! Excellent, will be sharing this with friends curious about the game! Probably one of the most digestible intros to Artifact I've seen. Thanks, rokman!